Twenty-four of the world's best surfers are scheduled to compete Friday at the Mavericks Invitational. Tens of thousands of people are expected to descend on Half Moon Bay to watch them. But they won't be watching from the nearby beach or cliffs. This year, those are off-limits to spectators. So how do you get a glimpse of the big waves? Buy a ticket and go to the Mavericks Viewing Festival & Awards Ceremony at the Oceano Hotel, which is across the street from the beach. They'll have big screens set up there. If you get the Universal Sports Network, watch the final heats on TV. The restrictions are in place for a couple of reasons. The conditions that create the waves, ideal for daredevil surfers, also make it dangerous for people on the beach. 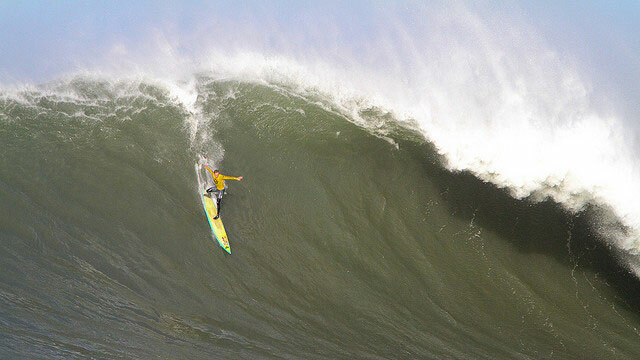 At Mavericks in 2010, a sneaker wave upended spectators and injured some of them. "Mavericks notwithstanding, it's not a good day to be at the beach," said Rebecca Rosenblatt, a spokeswoman for the San Mateo County Sheriff's Office, which does not want a repeat of the 2010 incident. She said there are environmental concerns, too. With 30-or-40,000 people, the coastal plants get trampled and the soft sandy cliffs nearby might not be safe. The giant waves only happen in the winter, and don't come every year. They start forming far offshore, in storms over the Pacific. The waves escape the storms, hurtle toward the coast, and run into the Colorado Reef, which lies just off of Half Moon Bay. "It goes from really deep water to really shallow water fairly quickly," explained Larry Smith, a meteorologist at the National Weather Service in Monterey. "And that kind of pushes the wave energy up and gives them a tremendously large wave." Smith says the faces of the waves could be 40 feet or higher.